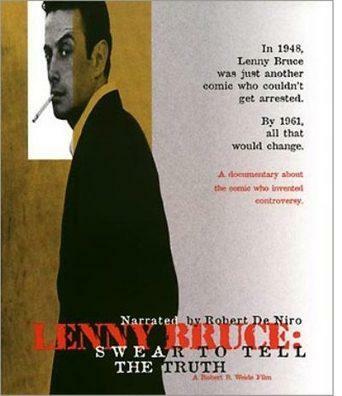 If you have heard of Lenny Bruce but don’t know too much about him this is the perfect starting point. Narrated by Robert De Niro, which is rare and thus lends the proceedings a New York street gravitas. Bruce was a true pioneer, a lone vanguard…busting through unspoken aloud societal constraints and constantly asking questions. A true seeker. A true anti-establishment. A true comedian. He changed the definition of what comedy could be. Always outspoken on stage, saying things that hadn’t really been said before, at least on a platform so exposed and it eventually got him into trouble, especially with the Catholic community, particularly a judge who took umbrage to some of his alleged comments. Social comments done in a humourous way. This is what makes a great comic nowadays, the ones who say what no-one else will, not because it’s daring or controversial but because great comedians are able to hold a mirror up to society and speak the truth. Possibly the only profession that has this, right? This is mostly allowed now because of Lenny Bruce. Brought up on obscenity charges because of a vendetta by certain offended powers, he battled with these charges for the latter part of his life. In the end he was so beaten down by the government that it killed him but the victories he paved the way for, as far as freedom of speech were seen in the comedians who came after him, Richard Pryor, George Carlin all the way through Bill Hicks, Dave Chappelle and Chris Rock. No comic has been arrested in the U.S. on obscenity charges since. He painted a target on himself by taking to task the powers in place, he was a revolutionary, a threat to certain organisations and status quo; asking questions and stepping on toes will get you into trouble. Thinkers that question the powers and do so on a public stage need to be shut down by those powers, especially if it contradicts ways of thinking designed to narrow the minds of the masses, thus allowing the powers that be to stay in that position. It’s an age-old story, one that inevitably takes its toll upon the protagonist. And there’s the cost, there’s always a cost, a trade off, whether you like it or not, this seems to be an natural exchange. Directed by Robert B Weide this is fascinating insight into the mind of a maverick, a one of a kind and highly influential. A must watch for all who appreciate the history of stand up comedy.